‘Texas Midwest’ wetlands lure large numbers of overwintering waterfowl. Right around sunrise, an unknown and unseen trigger compels thousands of geese to fly. All at once, the big birds rise from their overnight roost and churn in a great swirling tornado before they disperse to feed in nearby farm fields. The birds commingle in unfathomable densities for such a tight airspace, yet they never appear to collide. In a grand cacophony, the birds honk and whistle at one another as they take off. If you are close enough to the blastoff, the sounds drown out anything else around. This seeming chaos, however, is orchestrated by some unseen force that guides the geese to where they feed and then back again to rest and roost in the shallow closed basins they frequent each winter. Predictably, each spring the geese move on to their northern nesting grounds. When winter’s alabaster hues tug at their migratory urges, the geese (as well an amazing number of ducks) return to a patch of southern ground that is an unlikely hot spot for waterfowl. Geese flock to the Winchester Lakes area. Driving through the countryside in northern Haskell and southern Knox counties, you’d never expect this place to be a waterfowl hot spot. Vast stretches of farm and ranch land extend in all directions, intermittently interrupted by a tiny town here and there. Pump jacks pepper the area; giant wind farms with hypnotically churning turbines hint at the area’s energy production potential. Called the “Big Empty” by some or the “Texas Midwest” by others, the red lands in the northern stretch of rural Texas are mostly devoid of extreme topographical relief. 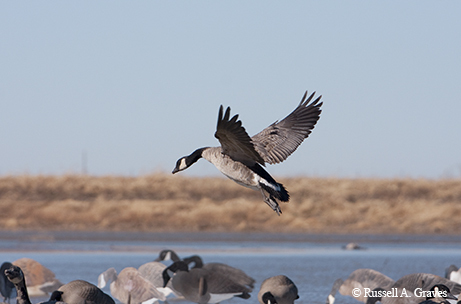 Add a little water to the mix and the area becomes a hot spot for overwintering waterfowl that travel down the Central Flyway from the Northern Plains, Canada and Alaska. The lakes, which lie roughly between the communities of Weinert and Rochester, run along a northeasterly seam of land that’s bounded on the east by tens of thousands of acres of ranchland and on the west by extensive irrigated cropland that produces commodities like wheat and peanuts. In a wet year, there may be as many as a dozen small lakes that hold overwintering waterfowl. The water, however, is only half of the magic recipe that attracts world-class waterfowl numbers to the region. The Winchester Lakes wetlands, in a rural area of North Texas north of Abilene, are a waterfowl hot spot. In terms of all waterfowl, the area’s numbers are strong. Ducks, which make up the bulk of migratory waterfowl in the Texas Rolling Plains, are generally scattered among the region’s numerous stock ponds and backwater river sloughs. The real concentration of geese is in the Winchester Lakes area. According to TPWD’s midwinter waterfowl survey numbers over the past 20 years, three primary species of geese winter here: greater white-fronted geese (colloquially known as specklebelly geese or specks), lesser Canada geese and snow geese, with an occasional Ross's goose mixed in. 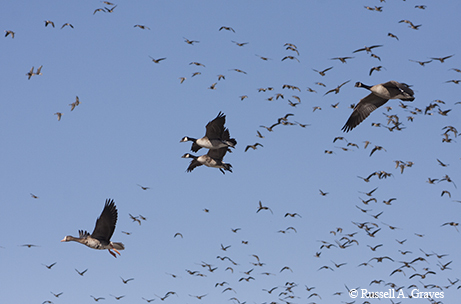 Canada geese make up the bulk of the overwintering goose species here, calculated at a 20-year average of more than 62,000 Canadas each winter. Around 21,000 white-fronted geese show up, too. In all, on this sparse stretch of ground, about 90,000 geese take off each winter morning from the dense string of naturally formed wetlands. The average, however, is skewed a bit because of the prolonged drought earlier in this decade and a short-term drought early in the last decade. Adjusting for these anomalous periods causes the yearly average of geese in the region to rise to more than 107,000 individuals each winter. The numbers are reasonably stable, according to TPWD’s trend lines. 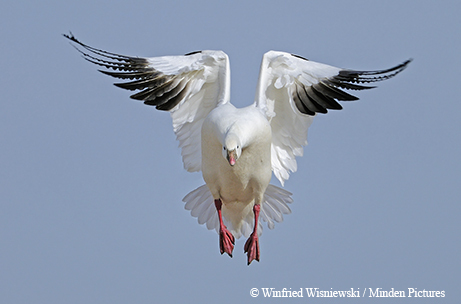 While the lesser Canada populations are trending fairly flat, snows and white-fronted geese are trending up over the past 20 years. Thanks to abundant rains, the habitat is in good shape and the farm fields are once again full of food that the birds prefer. That’s good news for area businesses, which rely on the dollars that hunters bring to town each year. “Goose hunters definitely have a positive impact on our local economy. They usually spend two to three days — possibly even a week — here,” says Jimi Coplen, director of the Development Corporation of Haskell, an agency that promotes economic development in Haskell County. 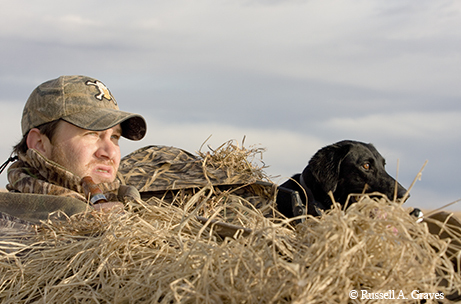 Erik Guggenheim and his dog wait for geese to fly into a decoy spread in the Winchester Lake area. It seemed as though we were getting to the water too late, but Hill — my guide and friend — insisted that later was better when hunting geese over the lakes. At sunrise we watched the geese fly off the lake. Their simultaneous blastoff gave us the opportunity to slip in behind them. As the geese flew off to feed, we walked across the super-skinny Winchester Lake water for about 100 yards out to the blind, constructed from T-posts and stock panels and socked in dried reed grass. My brother and I settled into the blind while Justin and his crew set out the decoys. In the misty distance, the lights of an ATV floated across the top of the water. The optical illusion made it appear that the vehicle was skimming across the liquid landscape. Where we hunt, some of the decoys are floating in water that’s only a couple of inches deep. The “lake” in which we hunt is literally a giant mud puddle, perhaps 80 acres in size. The water is muddied by thousands of geese standing in it all night. We settled into the blind, and after just a few minutes some stragglers began to return. Hill’s roost hunt strategy is one he’s employed for the past 30 years. Originally from Abilene to the south (where he still resides with his wife and two kids), he is a pharmaceutical sales rep during the week but guides hunters from all over the United States on the weekends. His exuberance for hunting geese shines through each time I’ve hunted with him over these lakes. “A lot of these birds come here all the way from Alaska,” he says, fiddling with the goose bands that adorn his call lanyard. For the uninitiated, biologists often tag a goose with a small aluminum band that wraps around its leg in order to study its movements. If a banded goose is harvested, a hunter can perform an online query at the United States Geological Survey and determine where the goose was banded. Despite his sunny optimism about goose hunting, Hill is concerned about the future of the geese in a place where conservation, energy production and land use collide. Already, Haskell County is emerging as one of the state’s premier energy production areas. Stretches of open and relatively inexpensive land have attracted not only traditional oil and gas exploratory interests but also renewable energy consortiums. Currently an expansive wind farm lies north of the county seat, while a vast solar farm is coming online southeast of town near Lake Stamford. Much of the new wind and solar generation develops in places like Haskell County where wide-open spaces and unique habitats are intertwined. The consumption of resources could affect the overwintering goose and duck populations. Kraai suspects that ducks used the wetlands even before Europeans settled the area. Geese, on the other hand, probably didn’t show up until agricultural practices changed and leguminous plants like peanuts were cultivated. Although peanuts grow underground, during harvest the ground is turned so the fruit can be collected. Since no agricultural harvest captures 100 percent of the crop yield, the spoils are left in the field and are consumed by all kinds of wildlife. The concern with wind energy is that the immense turbines will disrupt flight paths and create an inhospitable place for the geese. The geese may just move on somewhere else.